A few of my lovely coworkers have been reading this blog. (Thanks guys!) And, not surprisingly, one of them inquired when I was going to bring something off the list to share at work. (Our office has a healthy rotation of regular carb sharing) In fact, he even made a couple suggestions, since obviously, no one wants to share lobster at the office. Well…maybe at this office, but not at our office. So I took the hint and started looking at the list. I was browsing some back issues of Everyday Food by Martha Stewart and stumbled upon this recipe for Sweet Soft Pretzels. Perfect! I can make something off the list AND have a carb-licious treat to go with everyone’s morning coffee. 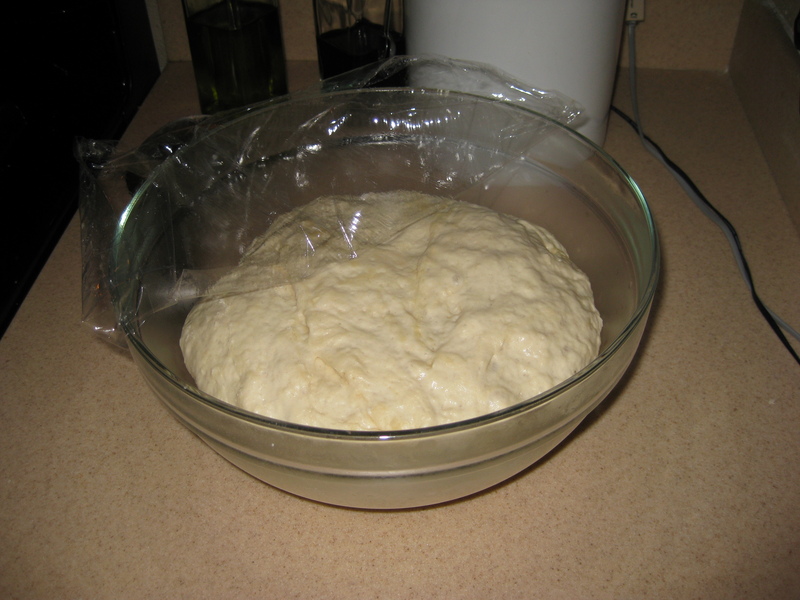 Cover and let the dough rise for about an hour, until it has doubled in size. For some reason, this is always thrilling to me. Coming back an hour later and seeing it grow like some crazy science experiment…it’s just weirdly exciting! A quick note: I made the dough the night before making my pretzels so it would have time to rise. I also timed my walk the next with the flyover pup around the dough. The dough was resting while we were busy barking at joggers in our neighborhood. This way I could make fresh pretzels for work without having to get up at 4am. 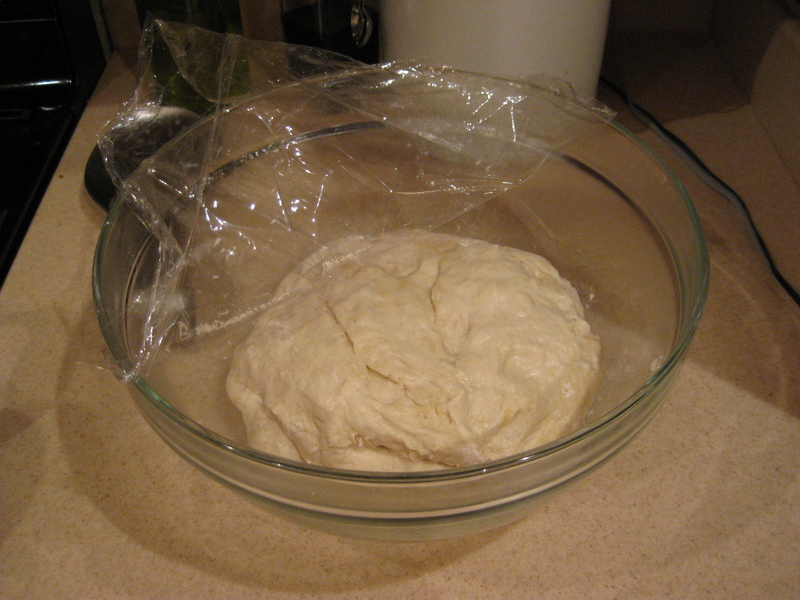 Ok, so we have the dough…now on to pretzels! I separated the dough in half and mixed 1 half with chocolate chips and one half with some golden raisins. Then let it rest again while walking my fluffy friend. After the dough has risen, I used 1/8 of each half to make the individual pretzels. 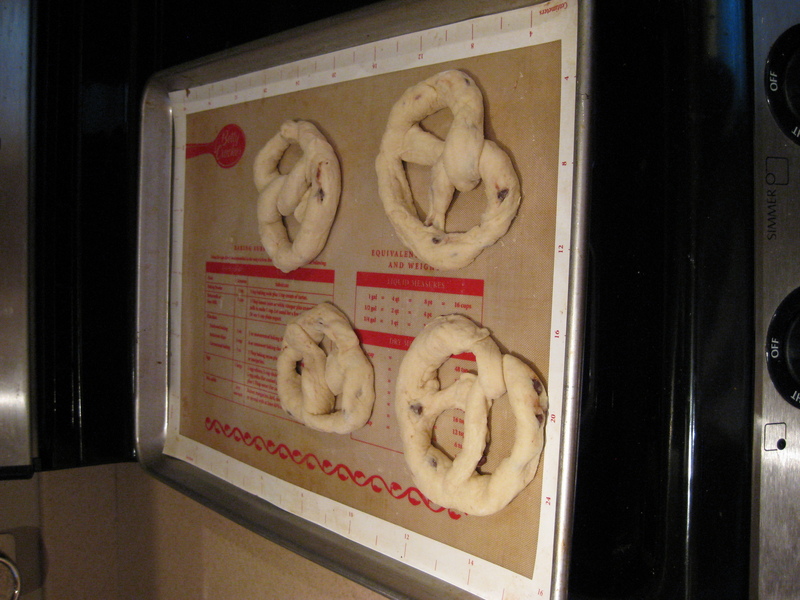 The hardest part was pulling and rolling the stretchy dough into a thin enough length to then form a pretzel. I found that I was stretching, forming into a pretzel, then holding it up to stretch it again so it would be thin enough. Formed Pretzels...in a (unintentional) variety of sizes! NOTE: the Everyday Food recipe has a super simple diagram of how to make a pretzel shape. (Make a U shape, cross the long ends, the bring down to the bottom of the U). So used that if you need help. Despite having watched the pretzel makers at the mall, I’m 95% sure I would have had trouble figuring out the process. I can’t even draw a pretzel!